At NWTT, we are continually researching new products to add to our range in order to offer the widest possible choice to our customers. 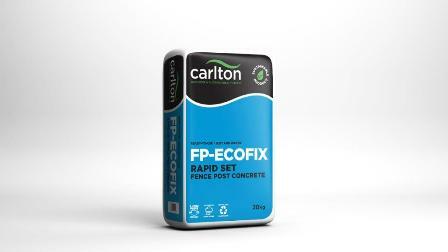 The latest addition to our collection is Carlton FP-ECOFIX, a rapid-set fence post concrete that is effective, reliable and sustainable. Carlton are specialist manufacturers of sustainable, eco-friendly building products and materials. By almost eliminating the use of virgin materials in its work while still offering effective products with no reduction in functi­onality, Carlton has dramatically lowered its carbon footprint and continues in its extensive research and development work with specialists including local universities. FP-ECOFIX, which is fully CE certified, carries the same eco-friendly credentials as the entire Carlton range, formulated as it is from a unique and innovative blend of low-carbon, sustainable materials. Even the plastic, showerproof bags themselves, each of which holds 20kg of product, are recyclable! Simple to use, this powerful fence post concrete sets rock hard after just ten minutes, offering professional, lasting results whether used with wood, metal or concrete fence posts. NWTT are specialist suppliers of a comprehensive selection of fence posts in a range of materials; our incised posts, which featured in a recent news article, are extremely popular and are available at an incredibly competitive price. From agricultural and commercial to domestic garden fencing, NWTT can offer a professional, cost-effective solution to all of your fencing needs. To find out more about FP-ECOFIX, simply contact our dedicated customer service team on 01942 720777 or send us an email to sales@nwtt.co.uk.